Every year my students LOVE reading Wonder by R.J. Palacio. 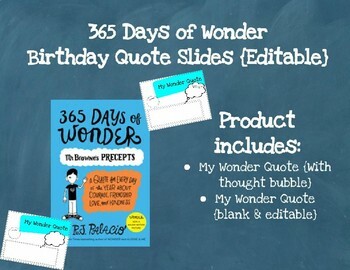 Without fail, my students buy or take out 365 Days of Wonder to keep the book of kindness going! This product is to be used alongside 365 Days of Wonder. Each student finds their "birthday quote." They read it, type it and then reflect on in in the thought bubble. My students love reading each other's quotes! It truly creates such a positive classroom community.